JAM Saddle Linen Ribbon is great for all of your gifts, crafts, projects, decorations, whatever you can think of! There are so many possible uses, you'll never run out of oppportunity to flaunt your perfect ribbon. 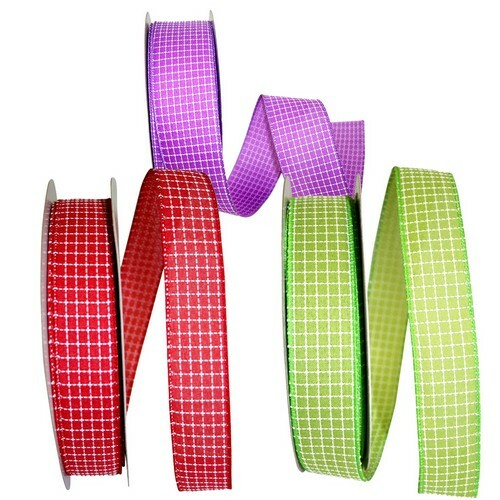 Our Saddle Linen Ribbon is made of 100% Polyester and the wired edge makes tying bows super easy! Saddle Linen Ribbon is available in purple, red, yellow, shocking pink, lime, hot pink, and coral. Our rolls are 50 yards in length, and come in either 1.5 inch or 2.5 inch width.